The Farlands – Some of the most enigmatic glitchy weirdness ever. Programming a video game is a huge task. You are essentially creating rules of a controlled slice of reality. If you want to draw your users in, it has to feel like a real world and behave like one. This applies even to the oldest, simplest video games. Sometimes, though, it’s impossible to test every scenario or know what strange unexpected action a user will take. This can lead to odd, confusing behavior or a total breakdown of reality. Sometimes, glitches misinterpret game data and create entire new worlds. Here’s a few examples of that and some explanations of why and how it happens. In most of these classic games, levels were just blocks of data stored sequentially, cross to the next room = load the next block of data. But sometimes bugs made it possible for these blocks to be misread or interpreted incorrectly. Check out some of this crazy stuff and explore these accidental worlds for yourself. As a kid, the “minus world” was almost like an urban legend. There was no youtube so we only heard word of mouth stories of people finding this secret world in one of the most famous games of all time. Turns out, it is for real. It’s apparently in the game’s data as level 36, but since there is no graphic for 36, it just says [blank]-1 for 36-1. The level can’t be completed, but as you can see in this hack, there are even more levels created beyond it if you use an editor to add a completion flag. Metroid was always kind of glitchy. You’d get stuck in walls sometimes, or see a creepy flutter of color at the edge of the screen as you leave a room making you wonder if something was just off screen waiting for you. Another childhood urban legend was that there were entire worlds you could access by slowing jumping your way through the ceiling while stuck in a door. And it was true! The story on this one, as some rom hackers discovered, is that once you leave a vertical area via the top of the screen (instead of through a door like normal), the game’s adjacent blocks of data (often the horizontal stages) gets interpreted as vertical stages, creating entire worlds filled with enemies, terrain and paths. It’s a super dangerous place, lava is everywhere and there are pits you can’t get out of, pitfalls that you can’t climb out of. Some journeys into the secret worlds only last a few screens before you by a dead end or die, others can go on for hours. There is of course, no goal, or way to return from them. There are similar bugs to be exploited with Metroid II and Super Metroid, but its amazing how substantial the secret worlds can be on the original. This one actually happened to me and freaked me out. If you use Item-1 to climb back up to the door in Airman’s boss room, you somehow scroll to the right into a trippy version of Airman’s level. The story here is that the developers probably never thought anyone would try to go back out the “in” door when they fought airman. It’s normally out of Megaman’s jumping range, but with the Item-1 you can do that. Then you once again get data read with the wrong tiles, an all kinds of weirdness. 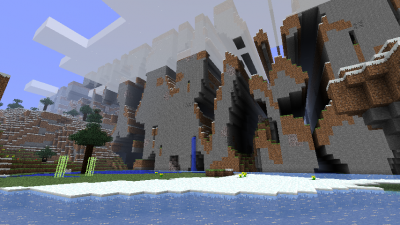 Minecraft generates its world based on an algorithm. Notch never imagined anyone would end up 32 million blocks away from the game’s starting point. At this point, the integer rounding errors start to throw things off. The normally serene and simple terrain of Minecraft starts to distort into a densely packed and twisted world filled with crazy patterns, finally ending in a gigantic “swiss-cheese” wall, beyond which rocks stretch off into eternity. Why does it remind me of Inception? Most people get here by using a hack or cheat to teleport out to this area. However, one man is walking there, in a surprisingly interesting youtube show. You can read more about it here, it will take him years to walk to the Far Lands, but he’s committed.There’s a bunch more glitches like these in classic games. Post some of your favorites.